I was always one to dismiss young love as idiotic, as naive, and somewhat unnecessary. I would stare at couples who seemed to get too serious in high school and just want to look at them and say, "You know you have no idea right?" That to try to understand that feeling was impossible as a teenager. These are the years you research it, get to know the ups and downs of it, that way when you are older and meet someone you could see spending those ups and downs with, you are fully prepared. It isn't until you meet that person though that you really start to think about love and all its complexities and sweetness and heartbreak. These emotions were dissected with great respect earlier this year in the ensemble film "Crazy, Stupid, Love" and now we have another film that likes to associate the word "crazy" with the emotion, but in a much more focused way. 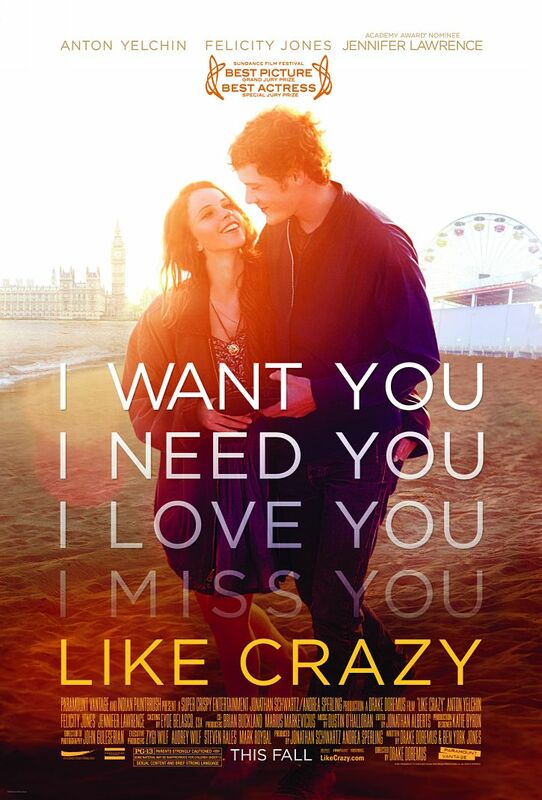 "Like Crazy" is a film that follows the progression of a couple through the honeymoon phase, where those cute looks give way to thousands of possibilities and the world is a place easily conquered if you have love. We see them grow, adore one another but also how they come to find each others faults and the negative ways in which they are dealt. It is an involving film. It is very real, honest, and simple but if you have ever had even the slightest hint of loving someone, of longing to be with someone in your life you will understand where "Like Crazy" is coming from and you will feel it. Anna (Felecity Jones) knows how to reel 'em in. We are introduced to Anna in school and as an aspiring writer. She is smart and pretty; we see that and are quickly given the impression she has a liking to another boy in class. Jacob, a furniture designer who is surprised to find the sweet note on his car that prompts him to call her. They meet up, go out and the first awkward conversations and situations ensue. This is obviously a smaller, more art house type film though and so without second guessing we know these young academic thinkers are quirky kids coming into their adulthood, surprised by the fact they are old enough to take on such responsibilities as jobs and love, and the potential commitments that feeling can lead to. As our two young lovers discover one another on that first date we to get to know them. It is clear that writer/director Drake Doremus is drawing from personal experiences here and in doing that he allows himself to focus soely on the faces of the two young actors playing Anna and Jacob. It is in their faces that we see surprise of how well this is turning out, that feeling that is almost impossible to describe where every angle of each others face and body language offers a kind of excitement that is unknown but attainable. It is more than something new, it is a feeling you aren't sure you've ever even heard of, but you like it and you know there is no way you will be able to stop yourself from falling for that person. Those young actors playing Anna and Jacob are to truly be comended for their work here. Both Anton Yelchin who has proved with every role that he is capable of bringing raw human elements to any situation does a really extraordinary job of that with such a simple and human situation. His co-star Felecity Jones who, in her biggest role to date, brings the film a life, a heartbeat that without her strong performance might have relegated this film to a sub par love story. No matter how much we understand what Jacob is going through and why he does what he does, we are given the story more through the perspective of Anna. Anna is the one who refuses to accept the trappings of the life she is supposed to lead when she knows that she will forever regret not being with Jacob. As Jacob Yelchin comes to terms with what his reality has presented him. The plot of the story coming from the fact Anna is a British college student who, after falling for Jacob overstays her visa and is then banned from the U.S. for doing so. It is the separation they deal with that tests their relationship, that gives the audience real concern as to if things will be happily ever after by the time the credits roll. It is a moment when Anna is in the UK and Jacob is hanging out with friends (both trying to move on) that Jacob calls Anna hoping simply to hear her voice after the time difference has not allowed them communication. We see him happy to hear her, but her dismissive tone so as not too seem upset puts him down. The call is short, not much is said and Jacob probably feels worse than he did before. He sits, staring at his phone unable to even enjoy the world around him because the one person he wants to experience it with isn't by his side. Then we cut back to Anna, laying on her bed and you can feel the heartbreak in how she lays. She curls up into the fetal position almost and you see the back start to jerk signaling the tears on her face. At this point we don't even have to see her face to know what she is going through. She sits back up, knowing she was wrong for trying to fool herself and calls Jacob back. It sounds slightly melodramatic here, but it is captured so perfectly, so honestly that if you don't feel Anna's hurt then there is seriously something wrong with you. as well, but it doesn't comapre to he and Anna's. The appealing relatability of "Like Crazy" makes it a film that most will enjoy not because of its originality but in the way it approaches its subject matter. As the story develops I'll admit to getting slightly frustrated with the way Jacob comes to kind of be less passionate about his relationship with Anna. She seems to always have Jacob on her mind, an inescapable part of her life she feels incomplete without, yet Jacob seems almost content with settling on Sam, the more convienent of choices plyed here by Jennifer Lawrence. It is understandable and I get it, but even when we see Anna with another guy we still sense her allegiance to Jacob. That is lost when we see Jacob and Sam together. I will not spoil the end by saying whether or not they end up together because if you get the chance to view the film you certainly should and it should no doubt be a journey of love that you take with these two. I will however comment that Doremus perfectly handles his final moments, focusing again so closely on the facial expressions and crosscutting these unspoken feelings with flashes of one another at the beginning of their relationship. It is not a clean resolution to be sure, but it is satisfying and explains that feeling of love and it's overall meaning in life as tenderly as the entire film tries to explore it.